New York Times bestselling author Teresa Medeiros absolutely dazzles in this quick-witted, laugh-out-loud funny, and highly moving love story that will set readers’ hearts atwitter. Abigail Donovan has a lot of stuff she should be doing. Namely writing her next novel. A bestselling author who is still recovering from a near Pulitzer Prize win and the heady success that follows Oprah’s stamp of approval, she is stuck at Chapter Five and losing confidence daily. But when her publicist signs her up for a Twitter account, she’s intrigued. What’s all the fuss? Taken under the wing of one of her Twitter followers, “MarkBaynard"—a quick witted, quick-typing professor on sabbatical—Abby finds it easy to put words out into the world 140 characters at a time. And once she gets a handle on tweets, retweets, direct messages, hashtags, and trends, she starts to feel unblocked in writing and in life. After all, why should she be spending hours in her apartment staring at her TweetDeck and fretting about her stalled career when Mark is out there traveling the world and living?Or is he? 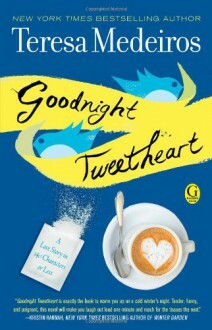 Told almost entirely in tweets and DMs, Goodnight Tweetheart is a truly modern take on a classic tale of love and loss—a Griffin and Sabine for the Twitter generation.